the nytpicker: It's Wednesday at 11:18 P.M. Why Hasn't The NYT Yet Reported The Dalton School Suicide Story? It's Wednesday at 11:18 P.M. Why Hasn't The NYT Yet Reported The Dalton School Suicide Story? News of the tragic apparent suicide of a 17-year-0ld Dalton School student this morning -- reported by the Associated Press at 12:22 p.m., and since posted on every major NYC news website -- has yet to appear on the NYT's website at this hour. Little is yet known about what happened, of course -- the stories that have turned up on the Post, Newsday and Daily News websites don't have much information. There have been scattered details about the time, the circumstances and the shock created by the student's fall into the school playground during the middle of a school day. But for New Yorkers who turn to nytimes.com for authoritative coverage of local events, the failure of the NYT to post anything at all left readers scrambling to websites with far less news resources. The failure of the NYT to post a story seems an odd mistake at a time when the paper crows regularly -- and legitimately -- about its wondrous website. The NYTPicker checks the site every five minutes or so, and we doubt we're alone; the combination of wire-service speed and top-quality reporting makes it indispensable for people who want to stay current at all times. 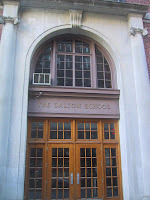 And let's face it; Dalton is an East Side institution that counts thousands of NYT readers among its alumni and family. News of a Dalton suicide is, frankly, of intense interest to its website readership. For the NYT to have held back its story for tomorrow's print edition seems like the wrong decision to us, and probably to the thousands of readers who've looked at nytimes.com for authoritative coverage of the story this afternoon and evening, in vain. Is there any doubt that if this were a public high school in the Bronx, this would have been reported? My guess is that someone who knows someone at the Times asked them to hold back. And maybe I am imagining it, but did the Times have a brief wire item yesterday afternoon? Even if it did, can't excuse this blackout. I believe Bill Keller's daughter is at Dalton as a student. So that would count as "someone who knows someone." It is bizarre. I found your blog after searching their site in vain for this very story.